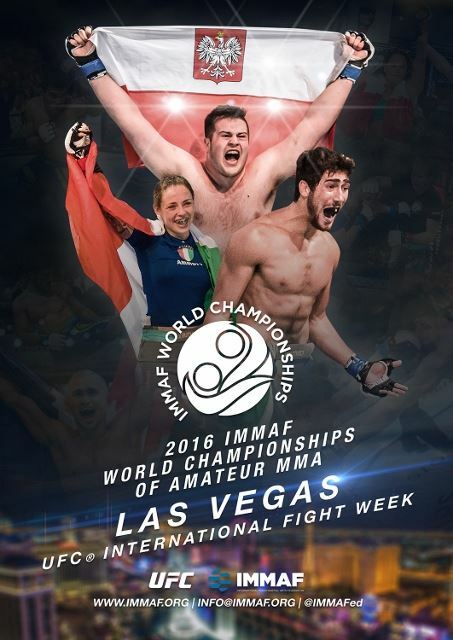 The IMMAF World Championships of Amateur MMA will return to Las Vegas (USA) in 2016 for UFC® International Fight Week, the planet’s largest celebration of combat sports. Hosted by the global governing body for MMA, the International Mixed Martial Arts Federation’s third instalment of its prestigious 5 day tournament will be broadcast on UFC FIGHT PASS and international television as part of ongoing broadcast partnerships. The dates and location for IMMAF’s pinnacle annual event are yet to be announced. Following 2 successful annual World Championships, the founding of Continental Amateur MMA Opens and the launch of the IMMAF World Amateur MMA Rankings, the 2016 World Championships is expected to outshine all previous IMMAF contests. While the 2015 IMMAF World Championships attracted Amateur competitors from 27 countries, IMMAF participants for the upcoming IMMAF European Open are numbering close to 200. With the expansion of IMMAF membership to 47 countries and ongoing increase in the level of competition, the 2016 IMMAF World Championships is set to present an unmissable week of elite Amateur MMA action. IMMAF Championship events follow a unique tournament format within the sport and competitors are selected by draw to determine who they face in each round of competition. With 9 weight classes for men (Flyweight – Super Heavyweight) and now 5 for women (Strawweight – Lightweight), the international event follows the unified IMMAF Rules of Amateur MMA. Full event details are yet to be released. Rami Aziz Believes Al Sewady is Hallucinating !